This formation is a balanced one with 3 at the back. In defense, the wingers track back effectively, and the two CDMs give you sturdy platform in the middle, giving you good pitch coverage. In attack, you have lots of passing options. Two strikers to give you different options up top, backed up by the CAM and two wingers, you can really move the ball around and find space. If you lose it in the middle you have the two CDMs to try and win it back. Then let's take at a look at how to use players (suggestions over the players). Goalkeepers: Height and reflexes are the most important. CB's: At least 75 pace for the left and right centre backs. 65 or 70 pace for the middle. It would be better if they are tall and/or really good in the air, because if you face someone who crosses a lot, chances are most of them are going his way since he's bang in the middle. For the work rates, ideally you want all three to have M/H or L/H work rates, especially the left and right ones, because if either of them drift forward it will leave a large hole down one side of your team. You can get away with the middle one being M/M or H/H though. If the opposition winger is advanced down the wing, these guys need to get across to them. And there are plenty of 75 pace M/H or L/H centre backs to use. CDM's: Tall is the first to consider as every opposition goal kick or clearance is landing on one of these two guys so try and ensure they're either 6 foot, or at worst 5'9 with really good jumping. Your CDM's must be good at passing and defending since since they will be doing a lot of your passing in the middle. Pace is not much to consider. But it would be convenient if your one of CDM has a good 75 pace. Any combination of M/M, H/H & M/H seems to work when you consider the work rates. Wingers: Plenty of pace is better so that your wingers can cover a lot of ground so you don't want them to be late on arrival. 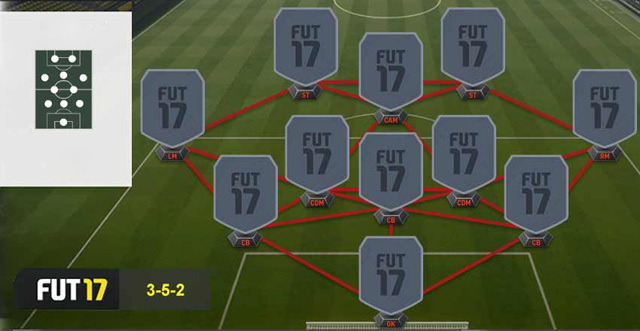 For your wingers, you can use some cheap players. H/M work rates are ideal and also the most common for wingers anyway. M/M or H/H work fine. CAM: Obviously they need to be good at passing, dribbling and shooting ideally. They don't need to be lightning, 70s pace is adequate. I personally don't like weak midgets but if they work for you, crack on. ST's: It's nice to go with two strikers who offer you slightly different qualities, so if one doesn't work then the other might. One big lad, one speedier agile guy is the classic combo. Avoid to M/M work rates, but H/L, M/L, H/M and even L/L (hello Mario) are all good. Even H/H seems to work fine. All your CDM's stay back when attacking, strikers get in behind, and wingers cut inside. Besides. here are a few suggestions for custom tactics. Set pressure low. And the build-up side of the custom tactics is up to you to have a play around with. Hope you feel fine with the suggestions. So are you gonna to use this formation or are you still playing with this formation? By the way, now you can get cheap FIFA 17 points for your PS4 and Xbox One.